This article applies to version 1 of Data Factory. 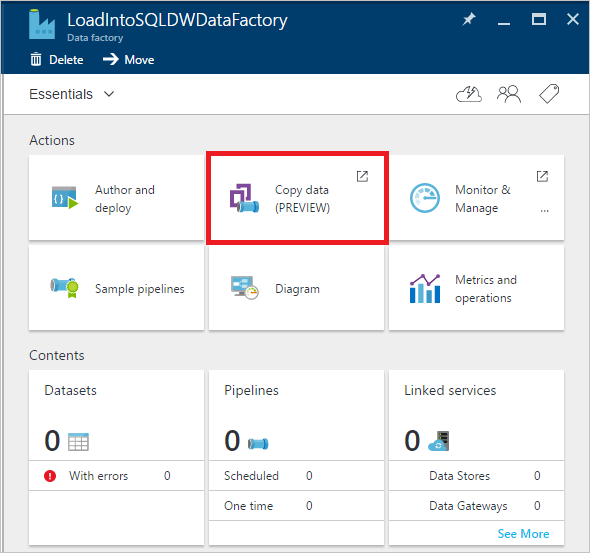 If you are using the current version of the Data Factory service, see Copy data to or from Azure SQL Data Warehouse by using Data Factory. Azure SQL Data Warehouse is a cloud-based, scale-out database capable of processing massive volumes of data, both relational and non-relational. Built on massively parallel processing (MPP) architecture, SQL Data Warehouse is optimized for enterprise data warehouse workloads. It offers cloud elasticity with the flexibility to scale storage and compute independently. Easy to set up: 5-step intuitive wizard with no scripting required. Rich data store support: built-in support for a rich set of on-premises and cloud-based data stores. Unparalleled performance by using PolyBase – Using Polybase is the most efficient way to move data into Azure SQL Data Warehouse. 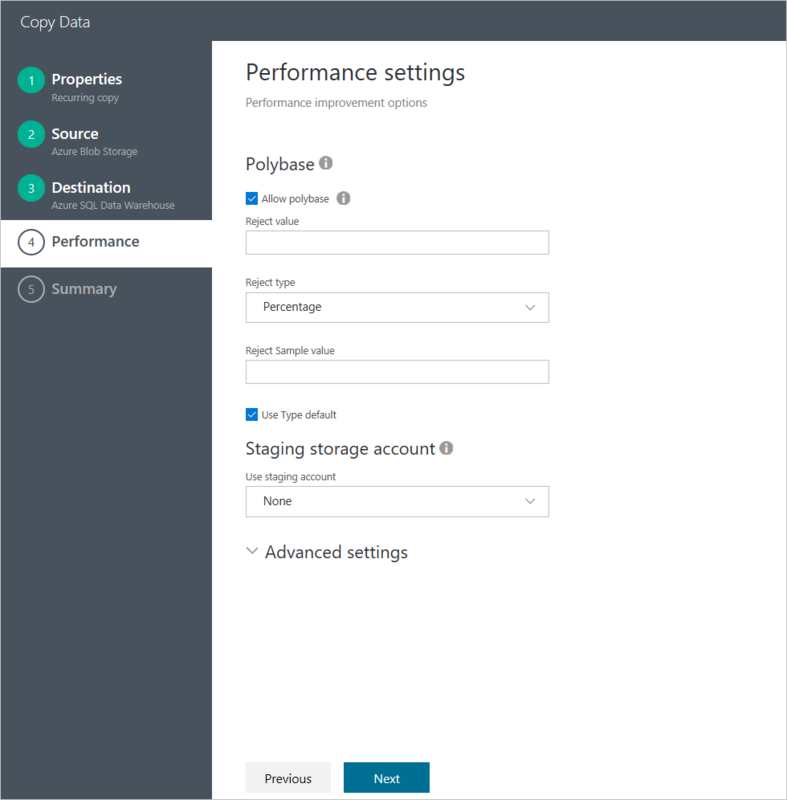 Using the staging blob feature, you can achieve high load speeds from all types of data stores besides Azure Blob storage, which the Polybase supports by default. This article shows you how to use Data Factory Copy Wizard to load 1-TB data from Azure Blob Storage into Azure SQL Data Warehouse in under 15 minutes, at over 1.2 GBps throughput. 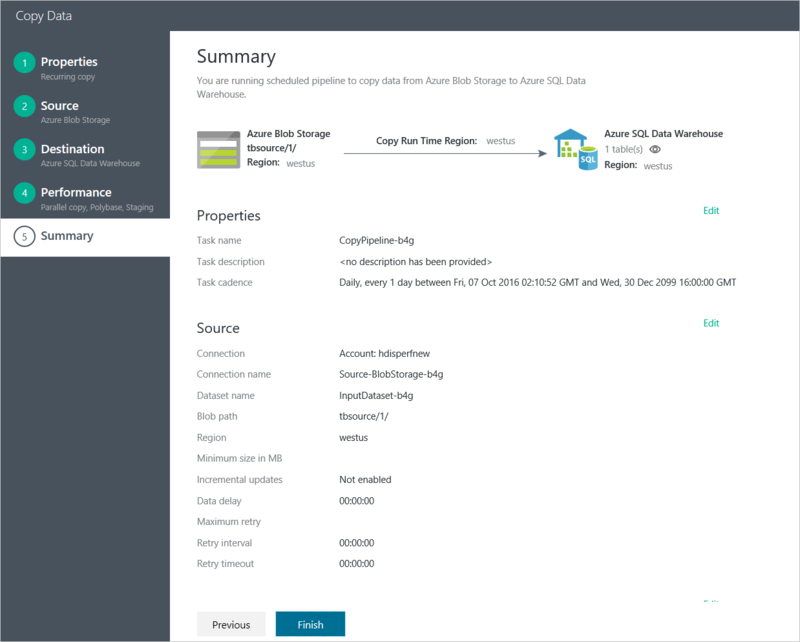 This article provides step-by-step instructions for moving data into Azure SQL Data Warehouse by using the Copy Wizard. 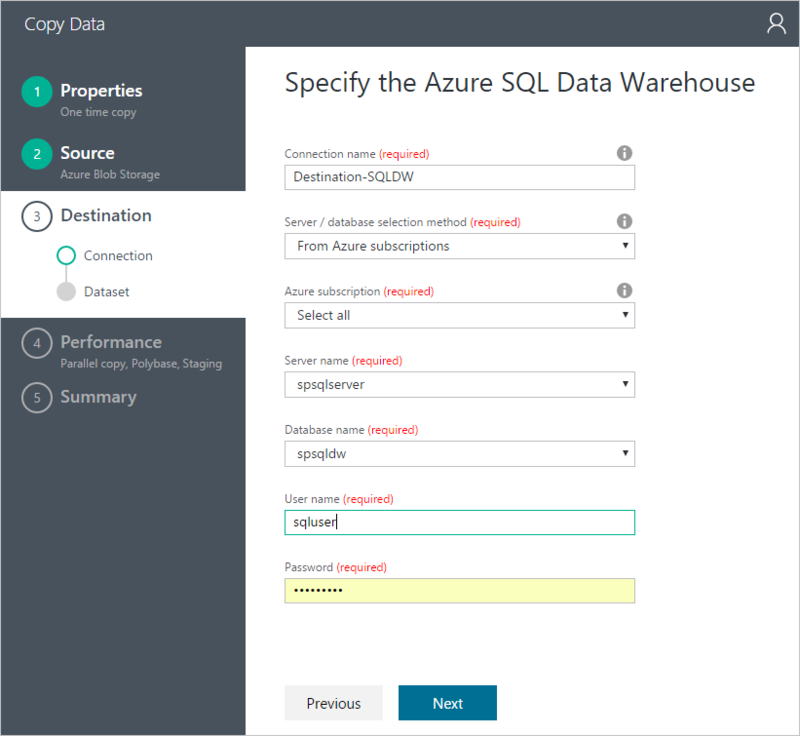 For general information about capabilities of Data Factory in moving data to/from Azure SQL Data Warehouse, see Move data to and from Azure SQL Data Warehouse using Azure Data Factory article. You can also build pipelines using Azure portal, Visual Studio, PowerShell, etc. 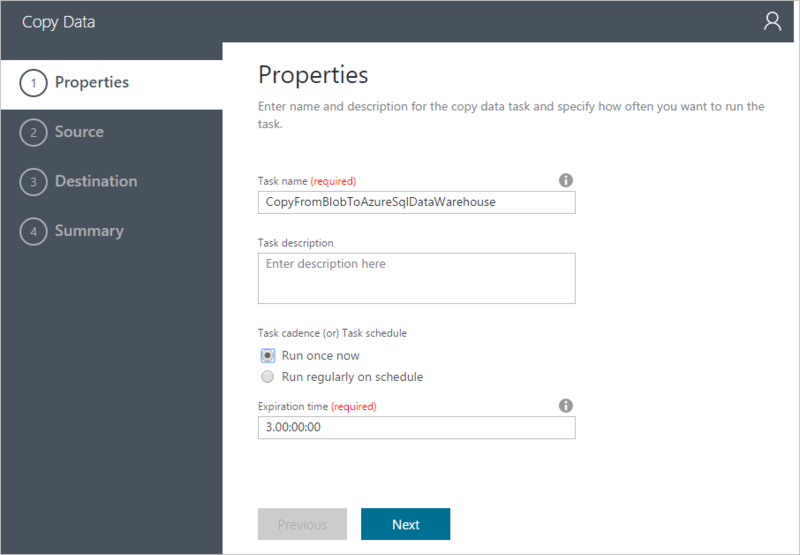 See Tutorial: Copy data from Azure Blob to Azure SQL Database for a quick walkthrough with step-by-step instructions for using the Copy Activity in Azure Data Factory. Azure Blob Storage: this experiment uses Azure Blob Storage (GRS) for storing TPC-H testing dataset. If you do not have an Azure storage account, learn how to create a storage account. Now copy the generated files to Azure Blob. Refer to Move data to and from an on-premises file system by using Azure Data Factory for how to do that using ADF Copy. Refer to Create an Azure SQL Data Warehouse for detailed instructions on how to create a SQL Data Warehouse database. To get the best possible load performance into SQL Data Warehouse using Polybase, we choose maximum number of Data Warehouse Units (DWUs) allowed in the Performance setting, which is 6,000 DWUs. Click the Scale button to open the following panel, move the slider to the maximum value, and click Save button. This experiment loads data into Azure SQL Data Warehouse using xlargerc resource class. To achieve best possible throughput, copy needs to be performed using a SQL Data Warehouse user belonging to xlargerc resource class. Learn how to do that by following Change a user resource class example. With the prerequisite steps completed, we are now ready to configure the copy activity using the Copy Wizard. Click Create a resource from the top-left corner, click Intelligence + analytics, and click Data Factory. Enter LoadIntoSQLDWDataFactory for the name. The name of the Azure data factory must be globally unique. If you receive the error: Data factory name “LoadIntoSQLDWDataFactory” is not available, change the name of the data factory (for example, yournameLoadIntoSQLDWDataFactory) and try creating again. See Data Factory - Naming Rules topic for naming rules for Data Factory artifacts. Select Use existing to select an existing resource group. Select Create new to enter a name for a resource group. Select a location for the data factory. Select Pin to dashboard check box at the bottom of the blade. 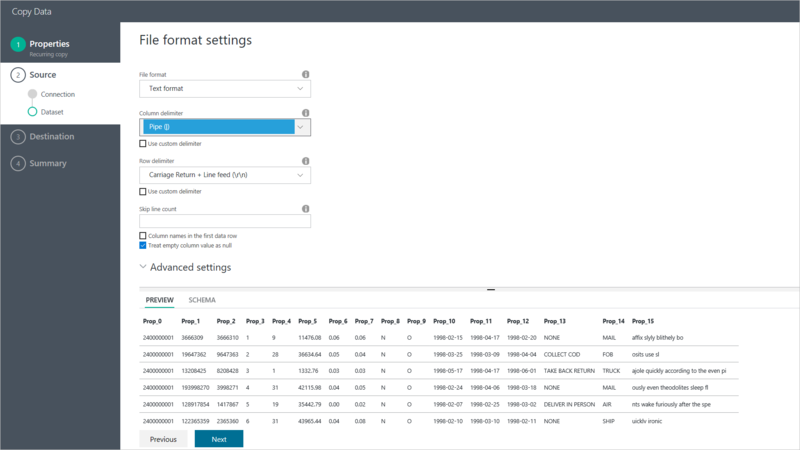 On the Data Factory home page, click the Copy data tile to launch Copy Wizard. If you see that the web browser is stuck at "Authorizing...", disable/uncheck Block third party cookies and site data setting (or) keep it enabled and create an exception for login.microsoftonline.com and then try launching the wizard again. The first step is to configure the data loading schedule. Select Run once now option. This section shows you the steps to configure the source: Azure Blob containing the 1-TB TPC-H line item files. 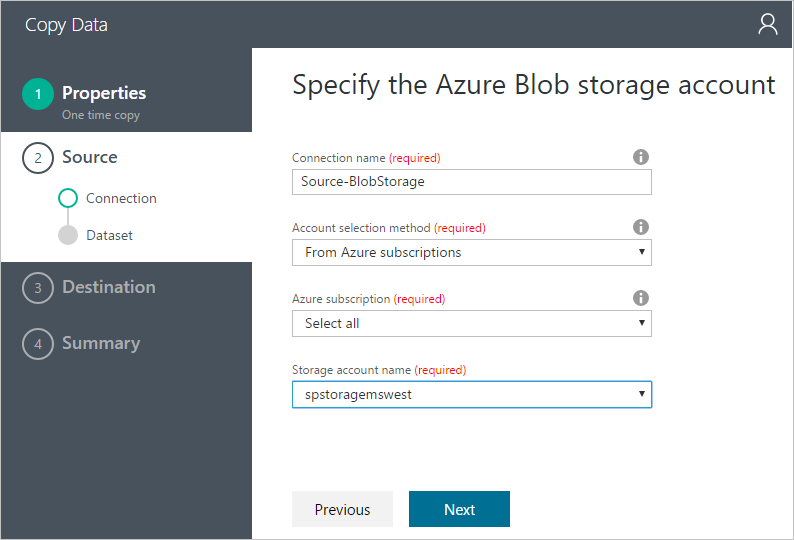 Select the Azure Blob Storage as the data store and click Next. Fill in the connection information for the Azure Blob storage account, and click Next. Choose the folder containing the TPC-H line item files and click Next. Upon clicking Next, the file format settings are detected automatically. Check to make sure that column delimiter is ‘|’ instead of the default comma ‘,’. Click Next after you have previewed the data. 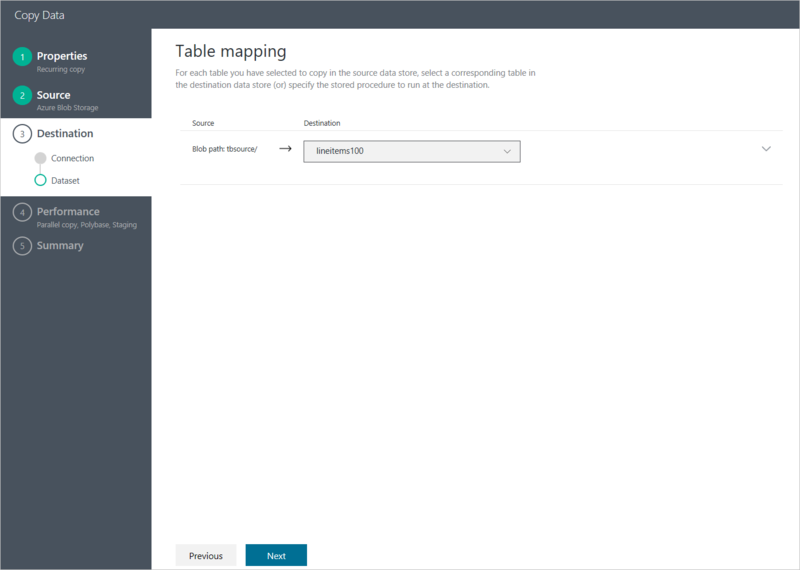 This section shows you how to configure the destination: lineitem table in the Azure SQL Data Warehouse database. 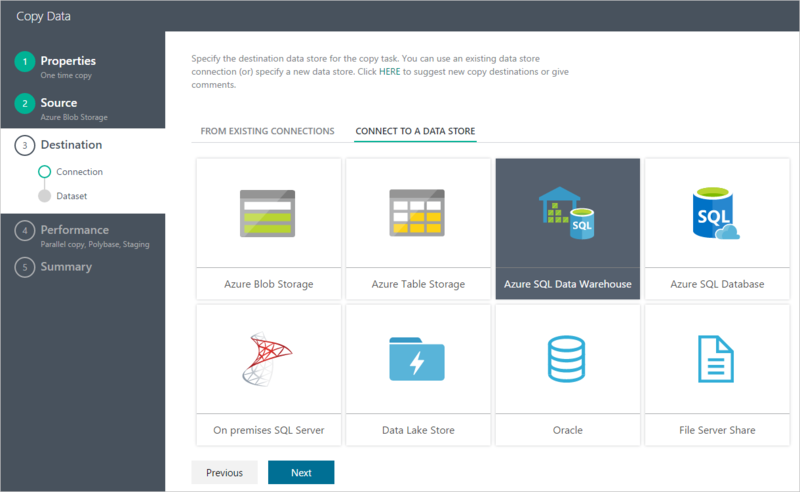 Choose Azure SQL Data Warehouse as the destination store and click Next. 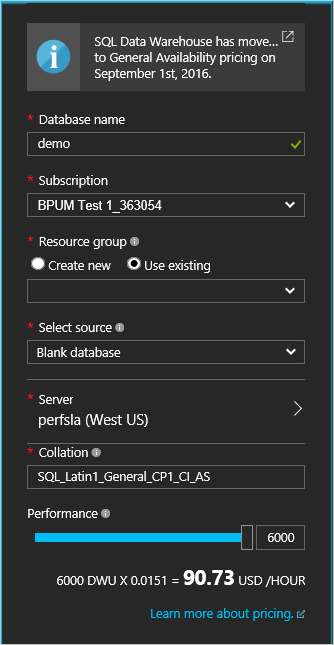 Fill in the connection information for Azure SQL Data Warehouse. Make sure you specify the user that is a member of the role xlargerc (see the prerequisites section for detailed instructions), and click Next. Choose the destination table and click Next. In Schema mapping page, leave "Apply column mapping" option unchecked and click Next. Allow polybase is checked by default. Click Next. Click Finish button to deploy. After the deployment is complete, click Click here to monitor copy pipeline to monitor the copy run progress. Select the copy pipeline you created in the Activity Windows list. You can view the copy run details in the Activity Window Explorer in the right panel, including the data volume read from source and written into destination, duration, and the average throughput for the run. 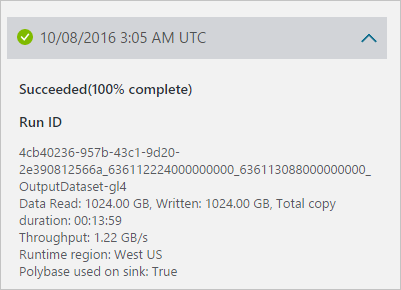 As you can see from the following screenshot, copying 1 TB from Azure Blob Storage into SQL Data Warehouse took 14 minutes, effectively achieving 1.22 GBps throughput! Use a larger resource class when loading into a CLUSTERED COLUMNSTORE INDEX. For more efficient joins, consider using hash distribution by a select column instead of default round robin distribution. For faster load speeds, consider using heap for transient data. 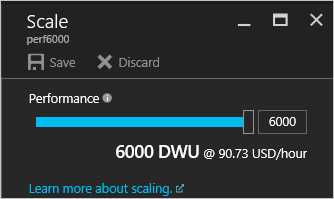 Create statistics after you finish loading Azure SQL Data Warehouse. 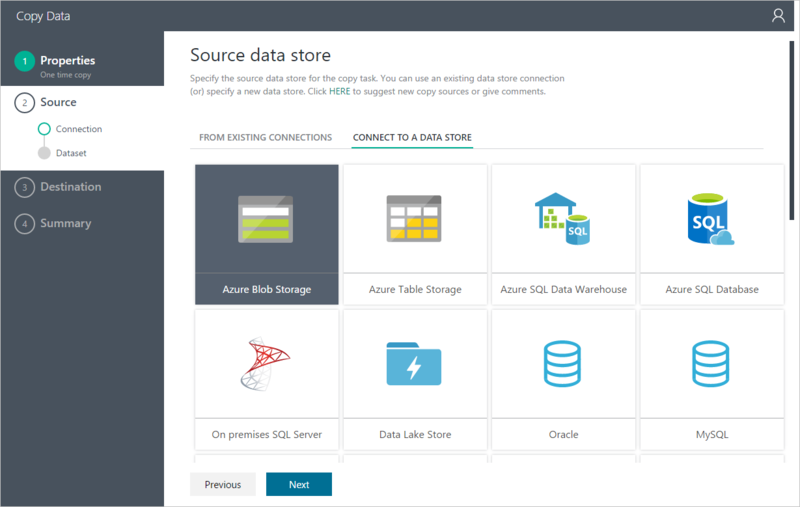 See Best practices for Azure SQL Data Warehouse for details. Data Factory Copy Wizard - This article provides details about the Copy Wizard. Copy Activity performance and tuning guide - This article contains the reference performance measurements and tuning guide.